I don't think that headline has been used anywhere, has it? Just trying to stake my claim to something original, I hope! Anyway, what a win by Nikolay Davydenko over the big man, Juan Martin del Potro: Well, actually what a tournament by him! He beat all of this year's Slam champs, which isn't too shabby a result. Congrats to him! 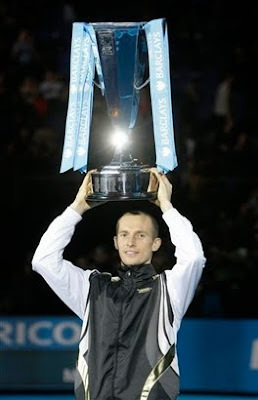 I'm going to take you back to a post I put up after he won Shanghai, "How will history judge Nikolay Davydenko?" I'd say with results like this, probably pretty favorably! You know, in the spirit of Thanksgiving, I think a special shout-out should go to the players competing in London this week for the World Tour Finals on behalf of tennis fans everywhere. The majority of the matches have gone the distance, and even the ones that haven't have had a touch of drama to them (such as Rafael Nadal's opening loss to Robin Soderling). 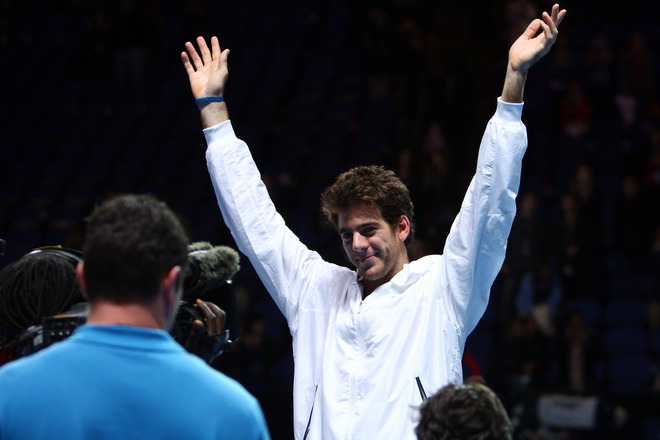 And how about Juan Martin del Potro squeaking into the semis? But if you beat the number-one player in the world, there has to be a place for you in there somewhere! Tough break for Andy Murray, though, who lost out by one game and actually beat del Potro early on. Something else to be thankful for while watching the tennis is seeing fans actually in the stands, even for the doubles matches. I don't know why it's become such a rarity to see people in attendance at year-end championships, but I'm glad that hasn't been the case here. So tennis fans out there, if you observe the day, hope you had a Happy Thanksgiving! And if not, set aside some thanks anyway for what's going on in London! First, sorry it's been a few days: A lot of baby action has been happening around the house! Now that that's out of the way, I'm ready to ride out the rest of the season and beyond! The ATP World Tour Finals are a matter of days away and the round-robin groups have been set up. I think it's hard to find a favorite in either group, except maybe Roger Federer in Group A. He should be able to handle Juan Martin del Potro and Fernado Verdasco (recent loss to Julian Benneteau notwithstanding). I'm going to call his match with Andy Murray a toss-up. In Group B, the hottest player on the planet (or any other one, for that matter), Novak Djokovic, is in the same side of the draw with Rafael Nadal, Nikolay Davydenko and Robin Soderling. I'm wondering if Djoko's good run of form can continue: He's played a LOT of matches the past few weeks. Nadal and Davydenko don't know the meaning of "quick points" and could give his legs a test. It should be a bunch of great matches, even in the round-robin phase. Italian open — and shut? This weekend's the Fed Cup finals and we all know the story of how WTA Championships winner Serena Williams decided to pull out of the tie. But you know what? I don't think it really would've made a difference because, man, that Italian team is tough! Francesca Schiavone has been one of the hottest players on tour the past couple of months and Flavia Pennetta has been having a career year. Plus, the tie is being played on a slow red clay court. Plus, plus, it's being played in Italy. Plus, plus, PLUS … naw, I'm just kidding, those are enough factors! 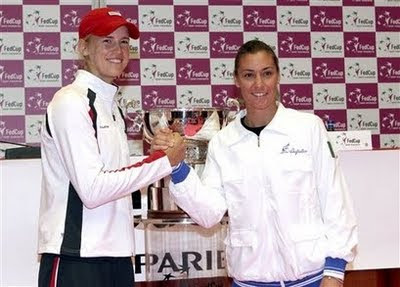 This U.S. team has been amazing this year with youngsters such as Melanie Oudin and Alexa Glatch coming up big in Fed Cup play, and those two are tapped to play the Italian stars this weekend. Of course, I'm going to be pulling for Team USA this weekend because their accomplishments this season had me observing Fed Cup like never before. But what a tough row to hoe they have now. Who knows? But I'm going to have to pick Team Italia to win this one.